Looking for movie tickets? 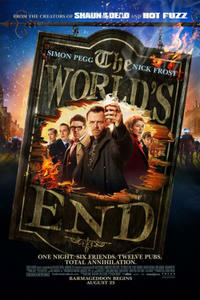 Enter your location to see which movie theaters are playing The World's End near you. In this week's Weekend Ticket, Fandango Chief Correspondent Dave Karger speaks with Simon Pegg, Nick Frost and Edgar Wright about their movie The World's End, opening this weekend. Five childhood friends reunite for an epic pub-crawl that turns into a battle for mankind.